The reed thicket where Dolasilla finds her unfailing arrows was connected by Wolff with a lake near Canazei, today completely filled up. The lake might have been another one, that also appears in the myth of the Sun's children, linked to the character of Elba. Actually, even generically localizing the lake in the Fassa valley is totally arbitrary. According to Wolff's description, the lake whose waters had a silvery appearance was located in the plain where today's Canazei (Cianacei, i.e. 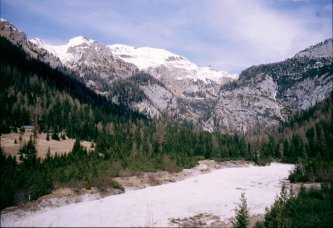 "reed thicket") stands , "below the Col da Ronc". It became a swamp over time and finally filled up with earth; the oldest villagers however, at Wolff's times, still remembered the presence of a reed thicket in that spot. Wolff was undoubtedly brought to localize the lake at Canazei by comparison with the one in Elba's legend, "of a clear and cold colour, like liquefied silver, so much that people told that a lump of silver was buried on the bottom". But this lake was located "east of Canazei" and "mount Vernel was mirrored in it". East of Canazei several places might once have been a lake; at least in the place called "Cian Trujan" or "Pian Trevisan", just at the feet of mount Vernel, a lake certainly existed, as proven by sediments. Probably, however, this second lake, today filled up also, couldn't be connected by historic remembrance with any reed thicket, therefore Wolff preferred considering it as different from the other one. However, just nothing proves that the lake was located in the Fassa valley at all. Had Wolff learned of the Fanes' saga in a different place, chances are that he would have located Dolasilla's silvery lake in some still different place elsewhere. The lec Sant (Sacred Lake) over the Gardena valley might just be one of the candidates. The milky hue of the water, more than with imaginary silver masses on the bottom, might be connected with dissolved minerals, as it happens e.g. in the therapeutic (sulphurous) sacred lake of Lagole, near Calalzo di Cadore. Therefore, if there is no evidence that the Fanes' silvery lake was actually located in the Fassa valley, less so at Canazei. If you would like to look for it today there, you would only find pensions and souvenir shops. Excursions: Canazei is a splendid base for a huge number of trips. 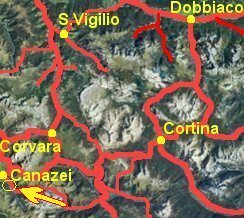 The one most connected with the Fanes, or better with the "Fassan trilogy" arbitrarily linked with the Fanes, climbs the Contrin valley from Alba m 1486 up to the Contrin hut m 2016 and from there to the Ombretta pass m 2702, at the feet of the awesome drop of the Marmolada South face. A little East of Alba, below the road that brings to the lake of Fedaia, the small plain of Cian Trujan can be easily reached, dominated by another imposing wall, that of Gran Vernel.